A healthy, beautiful lawn doesn’t just happen naturally. It takes a lot of work and know-how. Sure it’s true that in nature, there are always going to be elements that work together to create beauty. But, landscaping around a home or business is not appealing if nature has take over. That’s why most of us maintain the lawn near our homes or commercial buildings. While some just like to mow, others find it important maintain everything in the Racine landscape to keep it in tip-top shape. 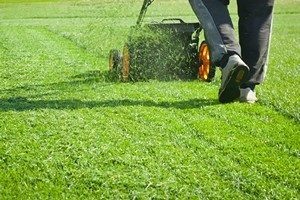 If you are a homeowner who wants a lush, green lawn, healthy thriving trees, beautiful flowers, and neatly trimmed bushes, you’ll need to know some important things about lawn maintenance in Racine. The professionals at CJS Lawn & Landscaping have put a few lawn maintenance tips together which can help work toward a beautiful, healthy, thriving landscape. If you ever need help taking care of your lawn maintenance in Racine, we’d be glad to offer you some assistance. There are important lawn maintenance tasks that need to be done at certain times of year. Everyone knows that there are certain times to plant grass seeds, new shrubs, vegetables, or flowers, but there are also certain times when it best to take care of fertilization, weed control, and dethatching. Weed Control – A pre-emergent crabgrass herbicide should be used in April. In late may, apply an herbicide to control actively growing broadleaf weeds. Don’t use it on newly seeded areas. Apply it again in September. Fertilization – Fertilize your lawn in late May using a controlled-release or slow-release fertilizer. Apply again in early July, but skip this application if your lawn has been fertilized consistently over the last 10-15 years or you normally leave grass clippings on your lawn after mowing. Fertilize again in early September. If you have removed clippings from the lawn after mowing, fertilize again in early October. Lawn Dethatching – The best time to dethatch your lawn in Racine is during spring after the grass begins to grown and turn green. Don’t dethatch if the soil is still wet and spongy or you will pull the grass up by the roots. Dethatching helps to eliminate the brown, dead thatch that is near the bottom of the blades. This brown thatch is not only unsightly, it’s unhealthy for the soil. Dethatching is important to aerate the soil. When grass grows for years on end, the thatch can become so thick that it chokes the soil. The thick thatch can keep water from absorbing into the soil. It also keeps clippings and other organic matter from reaching the soil where it turns into fertilizer. Be sure you set your lawn mower to mow the grass at the right height. If you cut the lawn too short, the grass blades are too short to hold water and other necessary nutrients. You’ll wind up with a brown, scalped lawn. Set the lawnmower height to leave at least two inches of blade. Don’t ever mow your lawn wet no matter how tempted you are. It tears the delicate blades instead of cutting them off sharply. This makes your lawn susceptible to disease and insect damage, it takes longer, and it damages your mower. If you have questions or are looking for a Racine landscaper for Lawn Maintenance, please call CJS Lawn & Landscaping at 262-878-1660 or complete our online request form.